After all these months of posting my street photographs in black and white, this week a color street photo is featured. I came across this in-grown plant that grows right out of a concrete wall covered with algae. 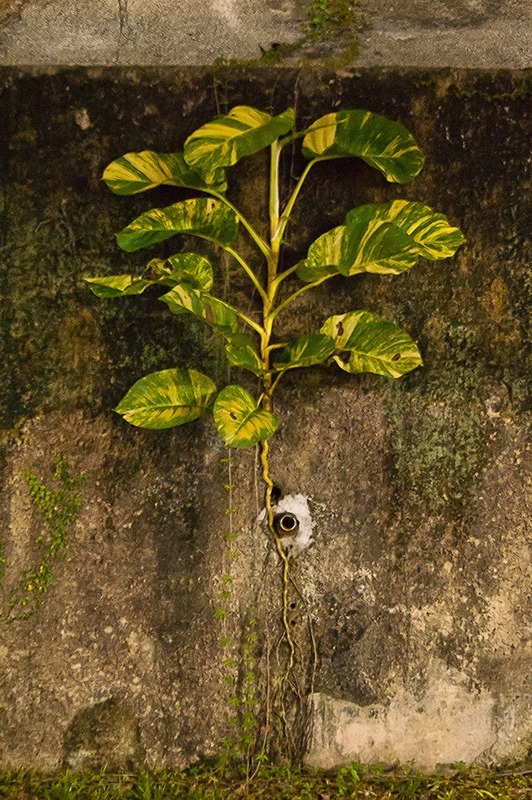 It must have been there for many years as its leaves are richly green and part of its roots is growing outwards hanging by the wall. It shows the power of Mother Nature. Look at how tough this plant is and they are capable of growing out from any surface of the Earth. 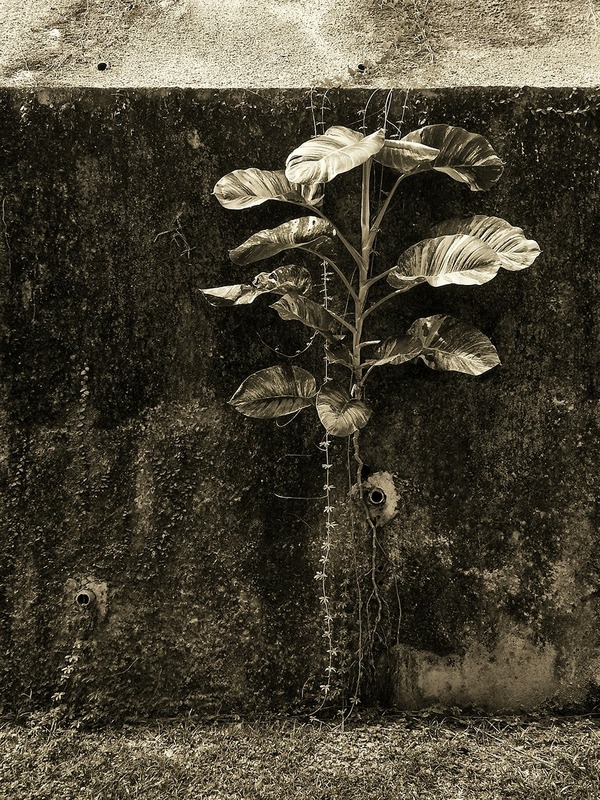 I approached this plant with a fine-art style of shooting and by showing the plant and the so-called decayed wall and surface textures, and a small patch of grasses, I want to show the living condition that supports its growth as well as a sense of scale. Street photography doesn't necessarily involves human subjects, architectural buildings a.k.a. concrete jungle, still found objects, etc etc. It involves landscape as well. As a usual practice, I converted this color image into black and white with added warm tone. In some sense, warm toned images have this 3-dimensional effect on them. It works well on this image too. Samsung S3 on default mode except WB set to Daylight. All post-production processed in Snapseed. Before I made the above image, I visited this place at night a day before and made a few exposures with my Nikon D70s. Below is the edited one. Nikon D70s on Tamron 17-35mm @ 24mm f/3.5 1/2 sec E.V. +5.0 AWB ISO 1600 Center-weigh Metering. This shot was exposed for half a second handheld, hence it looks slightly blur which has this soft painting effect but flat without shadows. I would have mounted my camera on a tripod and do some light-paintings but it's best to make the shot under natural ambiance lighting. Personally I prefer the warm toned version shown above. However the main purpose of showing these images is to explore with different lighting condition at different time of the day and see which works well.